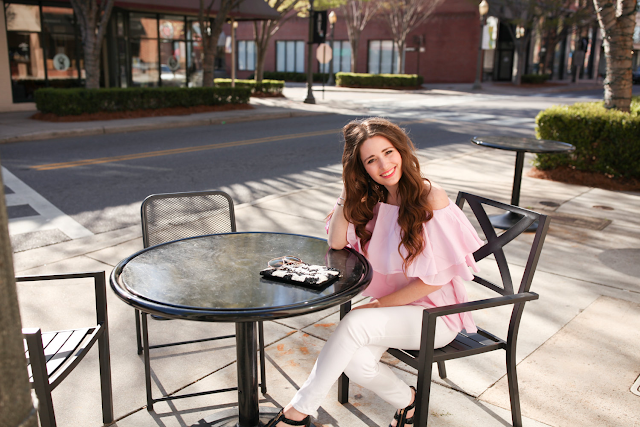 This outfit post is putting me in such a spring mood! Spring is my absolute favorite season- and I love just about everything associated with it, but especially spring fashion! The off-the-shoulder trend managed to last through the winter by sticking around on sweaters and dresses. I had my doubts about this at first, but I ended up getting down with it eventually (I styled an off-the-shoulder sweater in this post!). But off-the-shoulder for spring... that is something that I can get much more on board with! As soon as I saw this beautiful pink ruffled OTS top, I knew it had to be mine! It's just so feminine and darling, and it's also very relaxed around the stomach area which makes it even more comfortable to wear. And the best part of all?! It's under $20!! What a steal for such a pretty top. I probably say this about a lot of my photoshoots with Deeana, but I really loved these photos! We shot them in the downtown of Rock Hill, a charming small city in South Carolina, about 40 minutes south of Charlotte. Charlotte is an amazing city to blog in, and there are so many great spots to shoot in! But it is still fun to get out of the city sometimes, and discover all that the metro area has to offer as well, with great cities and towns in both North and South Carolina. 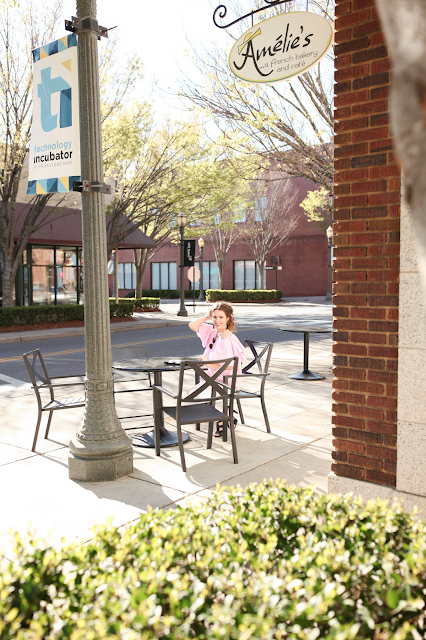 Last month, Deeana and I also spent time shooting north of Charlotte in the cute town of Davidson. 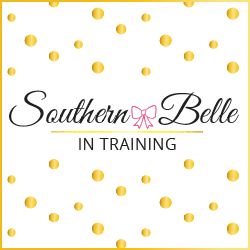 I am so, so SO excited for Monday's blog post! It's a long one, but I'll be sharing the big news that I've been teasing for a few weeks! In other news, I leave tomorrow for two weeks of travels! I'll be going on an international trip with my mom, but first I have a trip related to my big news. And before all of that- one night at home in Maine. I can't wait to see a couple of my high school friends tomorrow night before all of the traveling fun kicks off! Be sure you're following me on social media @miss_alk to keep up with my upcoming adventures. Such a stunning top! Where's it from?! You look gorgeous in that blush pink. You look so pretty! That color is perfect for you! That top is to die for and you look gorgeous! I love pink everything! That pink is so pretty with your hair! Can't wait to hear you big news :) Enjoy your travels! Uhhhh this is the cutest top everrr!! You look gorgeous! 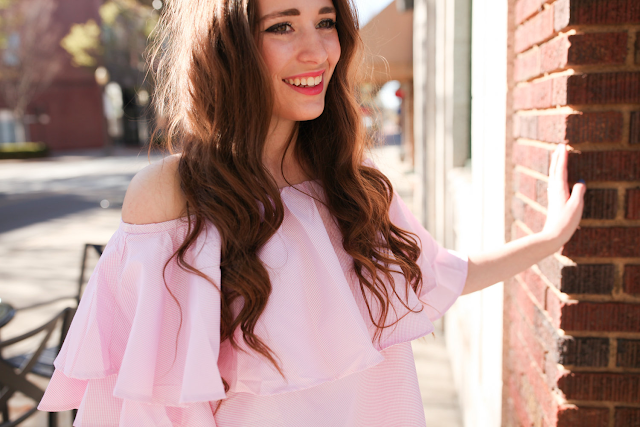 This top is so girly and fun! You rock it well girl. I'm loving this whole outfit! Have fun on your upcoming travels! :) Can't wait to check out Monday's post! The top screams spring and that town looks adorable! This top is SO cute, Annaliese! This color looks fabulous on you! I am loving the spring vibes! And these photos are so cute! Oh my gosh I absolutely love your top! The ruffles on the sleeve and it's off the shoulder! Absolutely perfect! This top is so adorable and i cant believe its under 20! That top is seriously cute in that color! I love this blush trend on OTHER people but my skin tone just does not agree with all this light pink. Wah. It's so freakin' cute though! These photos really are awesome, they highlight this gorgeous outfit really well! Such a cute look! I am obsessed with that top! Such a cute top! The ruffles are everything!